Take your professionalism to the highest level with Custom Tagless Care Tags. 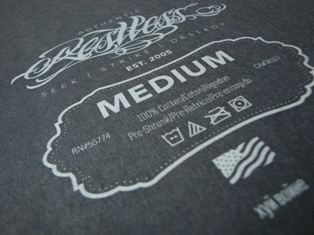 Designing & Creating Custom Tagless Care Tags is our Forte’. In choosing to order Custom Tagless Care Tags, you will be taking your professionalism to the highest of all levels showing your target market & clientele that you have the upper hand on the competition. It also presents you with the opportunity to promote your business, organization, or event by placing your website or social network link on your Custom Tagless Care Tag. We are happy to be able to offer this to our Clients at an affordable rate that won’t break the bank. If a unique & custom design is what you prefer, our Graphic Artwork Team is here to help. The best part, of course, is how comfortable you & your customers will be without an itchy tag to worry about. So we say go for it, why not?